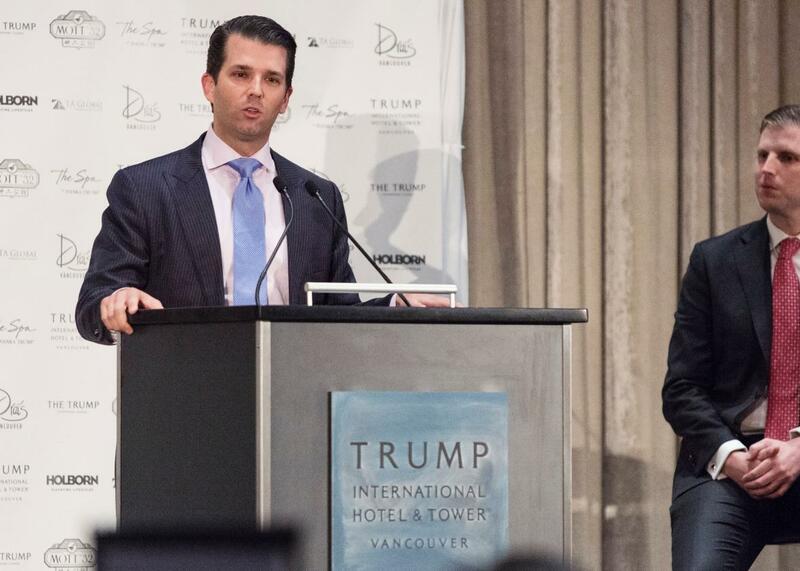 Donald Trump, Jr. and Eric Trump attend the inauguration ceremeony for the Trump International Hotel and Tower in Vancouver, British Columbia, on Feb. 28. Two weeks after Donald J. Trump clinched the Republican presidential nomination last year, his eldest son arranged a meeting at Trump Tower in Manhattan with a Russian lawyer who has connections to the Kremlin, according to confidential government records. … Donald Jr. described the meeting as primarily about an adoption program. Donald Trump Jr. posted his full exchange with a publicist for a Russian pop musician to Twitter on Tuesday, and the emails confirm previous reports that Trump Jr. was offered compromising information about Hillary Clinton specifically from the Russian government. The emails also say flatly that the Kremlin was working to help elect his father. The Russian American lobbyist who attended a meeting at Trump Tower last year is a former military officer long shadowed by allegations of connections to Russian intelligence. The June 2016 meeting at Trump Tower with Donald Trump Jr., Jared Kushner, and Paul Manafort included at least eight people. An audio recording of the meeting between Donald Trump Jr. and a Kremlin-connected lawyer may provide a clue as to the identity of the eighth attendee. In the brief recording, a knock can be heard on the door before a man says, “Hi, it’s me, Paul Ryan. Just wanted to poke my head in and say I’m cool with Putin paying Trump so long as I get to be the big tax-cutting boy. I also want to mention that I am not pausing for laughter here because this is not a joke. All right, have a nice day.” Our team of audio experts is analyzing the tape in an effort to identify the man. Colluding with a foreign power is the most American thing you can do, and the fake news media continues to ignore the fact that the great men who built this country—the Founding Fathers—did so through collusion. Makes me sick. Sources with knowledge of the meeting at Trump Tower have revealed that there was a ninth attendee, and they described this person’s behavior as “peculiar.” Midway through discussions, the unnamed woman is said to have lifted up her entire torso from a seam at her waist to reveal another, smaller woman residing inside. This interior woman repeated the act to uncover yet another woman, and this continued until a final woman, roughly the size of a bowling pin, teetered and fell on the table in front of Donald Trump Jr., who exclaimed, “I love it.” The nationality of these women is unknown. President Donald Trump announced today that he is intent on maintaining a smooth election process during the upcoming midterms, which is why the White House will be prioritizing a program that facilitates the adoption of Russian children.